The CMC family moved into their Rent-to-Own home in November 2018. 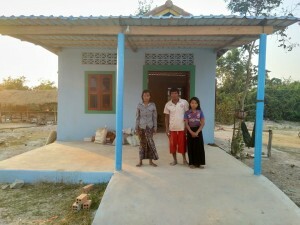 They are excited about the new home because it fulfills so many of their dreams. Now they can have a vegetable garden, enjoy their neighbors, and raise their children in a safe home that is suitable for studying. The CMC family first started working with Peaksneng Thormacheat Shop in 2015 when they started an organic vegetable garden. Mr. CMC’s mother moved in with the family and they had to give up their vegetable garden so she could plant fruits in the traditional way she enjoys. On their new property they have plenty of room for fruit trees, vegetables, and even livestock. They are also excited for their children to have the opportunity to grow up along other children their age and to have the benefits of a safe and secure home to study in. The family’s biggest challenge is access to water. The weather is currently too hot and dry to start new vegetable and fruit gardens. They will need to wait until the rainy season to start these activities. Their dream is to be able to send their two daugthers – age 12 and 13 – to university. They hope that when they start growing vegetable and raising livestock they will have money to put towards education.